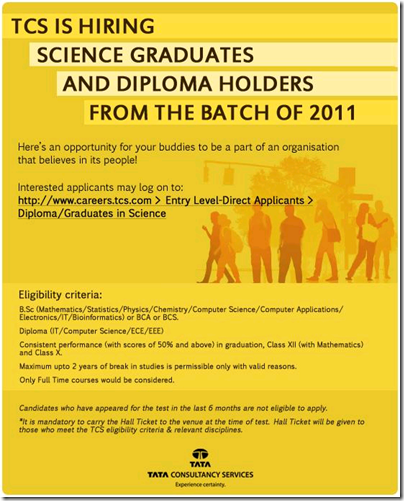 Here’s an opportunity for your buddies to be a part of an organisation that believes in its people! B.Sc (Mathematics/Statistics/Physics/Chemistry/Computer Science/Computer Applications/ Electronics/IT/Bioinformatics) or BCA or BCS. Consistent performance (with scores of 50% and above) in graduation, Class XII (with Mathematics) and Class X. Maximum upto 2 years of break in studies is permissible only with valid reasons. Candidates who have appeared for the test in the last 6 months are not eligible to apply. It Is mandatory to carry the Hall Ticket to the venue at the time of test. Hall Ticket will be given to those who meet the TCS eligibility criteria & relevant disciplines.